Last Wednesday, MK Danny Danon (Likud) notified me that Netanyahu was going to make a dramatic decision on the matter of the settlement outposts. I thrive on dramas. I called the defense minister’s media adviser, Barak Seri, and asked whether a dramatic decision on this issue, which is under the responsibility of the defense minister, was in the offing. Seri checked and reassured me: The defense minister is safely ensconced at home, there is no discussion, no meeting, no change, nothing to report. I was reassured. On Friday afternoon, the defense minister notified the High Court of Justice that the state was considering legalizing the construction in the settlement outposts Hayovel and Haresha, subject to a land survey that would determine whether the land belonged to Arabs or was state owned. The Prime Minister’s Bureau took the trouble to inform the media that the statement had been given. “Congratulations,” said Danon, a member of the right wing opposition in the Likud. Congratulations were also voiced by Shlomit Peretz, a resident of Givat Hayovel, the widow of Maj. Eliraz Peretz who fell in Gaza, and by Culture and Sports Minister Limor Livnat. What is the truth? There are countries in which such a gap between the prime minister’s version and the defense minister’s version would dismantle the government. But Israel is not like all other countries. Not only is there no dispute between Netanyahu and Barak in this case, it would appear that there is full coordination between them. This is a game, a great Israeli bluff. When the High Court of Justice called upon Barak, after endless delays, to announce when he would evacuate the settlement outposts that are illegal according to his own lists, he searched for a good excuse for another postponement. The excuse that he found was that a survey should be conducted. The survey would determine which houses in the settlement outposts were located on state land, and which houses were located on private Palestinian land. There is no survey, but there is a lie. The Civil Administration knows full well what belongs to whom in the outposts. Regarding Givat Hayovel, for example, they know that most of the houses were built on state lands, and some of them, including Peretz’s house and the house of Roi Klein, who fell in Lebanon, were built on private Palestinian land. The settlers of the Givat Hayovel settlement outpost, like the settlers of other outposts, invaded lands that did not belong to them. The question of whether the lands presently belong to the state or to private owners is secondary. Either way, they are squatters whom the state has promised, both to the High Court of Justice and to the Americans, to remove. The trouble is that Netanyahu and Barak are caught up in contradicting commitments: Netanyahu committed himself to the right wing section of his party that it would be all right, in the end everything would be legalized, and Barak made a commitment both to the High Court and to the Obama administration that it would be all right, everything would be removed. They decided to send another false letter to the High Court of Justice. Netanyahu explained what he explained to Benny Begin, and Barak explained what he explained to George Mitchell. They have a division of labor. The Israeli settlements in the territories have been managed by this method for the past 43 years. Netanyahu and Barak are no different from [Yigal] Alon, Peres or Sharon. The problem is that the situation has changed. The crisis of confidence between Netanyahu and the Obama administration has greatly reduced the government’s room for action. Netanyahu promised transparency: He would tell the Americans the whole truth. Barak was sent to Washington to persuade the Americans that the age of deception had ended. The proof is that when a freeze is declared, the freeze is real, down to the last lot in Ariel. The transparency stopped when it came to the settlement outposts. They could not evacuate them as they had promised, and could not honestly tell the Americans that they were unable to do so. Instead, they winked to everyone, including the High Court of Justice, whose champion Barak purports to be. Winks have their price. Mitchell can smile to the cameras in the prime minister’s office or the defense minister’s office, he also knows how to wink when necessary, but his administration exacts the price in other places. The administration is steadily distancing itself from any step that could block Iran’s nuclear armament. At the same time, the administration is making it possible, out of malice or weakness, to place Israel’s nuclear ambiguity on the international agenda. They will benefit twofold [from the freeze]. They will have completed the old and will begin the new, this time, with no restrictions. Moreover, during the freeze, exceptions committees were formed which gave permits to all who needed (and after all, everyone needed) and paid compensation to anyone who was hurt. Is there a downside? No wonder that the large demonstrations that the settlers held last December opposite Netanyahu’s residence faded away. The protest tent opposite the Prime Minister’s Office was also dismantled with the same speed it was put up. At this rate, they will yet ask for another construction freeze period. Q: Is Netanyahu pleased with what you’re doing here? Q: President Obama won’t like to hear your pronouncements. In a week in which indirect peace talks were supposed to get underway, Transport Minister Yisrael Katz went on a tour of Samaria and mainly displayed great proximity to the settlers. At the same opportunity, he stuck a finger in the Palestinians’ eyes. “The construction momentum in Judea and Samaria is the same as when it was at its peak,” Katz announced happily to Likud activists in the settlement of Revava on Tuesday evening. “Thousands of housing units are being built everywhere. I never liked the freeze. Nobody in the security cabinet likes the freeze. It was a mistake. You can’t take people and freeze them. That is no solution. The government will ensure that the construction momentum will resume this September. In any case, I know that as far as I am concerned, there is no freeze.”Katz toured the settlements for an entire day to observe the great construction boom already taking place on the ground, precisely at a time that the state is trying to show the world that it is limiting construction. The freeze, it turns out, was simply an opportunity to unfreeze land and prepare it for construction. The government froze new houses but allowed the settlers to complete houses for which the foundations had been laid. The result on the ground is unimaginable. Thousands of settlers rushed to work on what they had begun, before any new edicts could arrive. “The rabbis told us not to stop work. 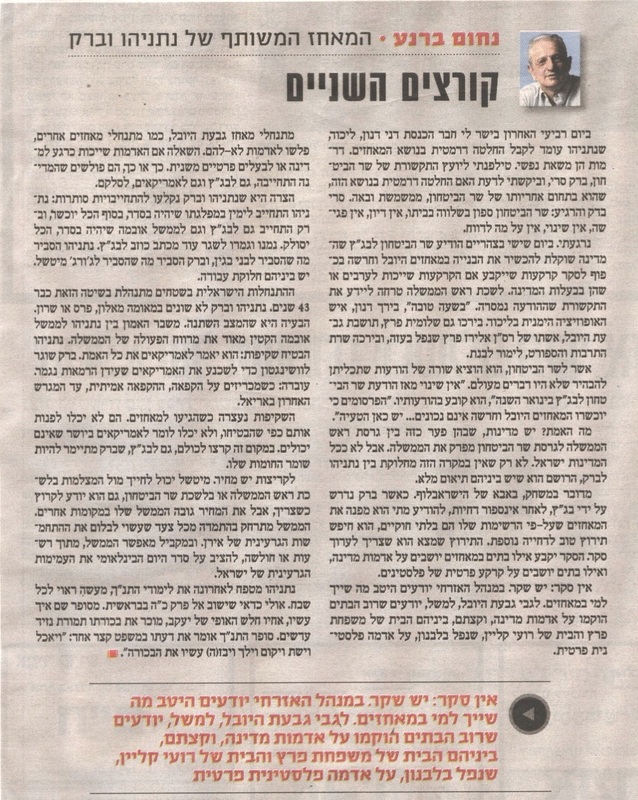 To continue to bang with the hammers, even on Yom Kippur,” relates Avi Cohen from Har Bracha, the chairman of the Likud branch in Samaria. The freeze will end this September. Avi Cohen and his buddies will begin to build foundations. They will benefit twofold. They will have completed the old and will begin the new, this time, with no restrictions. Moreover, during the freeze, exceptions committees were formed which gave permits to all who needed (and after all, everyone needed) and paid compensation to anyone who was hurt. Is there a downside? No wonder that the large demonstrations that the settlers held last December opposite Netanyahu’s residence faded away. The protest tent opposite the Prime Minister’s Office was also dismantled with the same speed it was put up. At this rate, they will yet ask for another construction freeze period. Everyone in Samaria is smiling. Sometimes openly, sometimes with a wink, usually with satisfaction. Even the claims, perhaps justified, about buildings that had become stuck in the middle, about money that had been lost, about unsuitable trailers in which entire families were crowded, about young couples who could find no place to live, bumpy access roads and all the rest—become lost in the face of this expansion enterprise, which appears to have no end. Minister Katz himself inaugurates roads there costing tens of millions of shekels as if there were no tomorrow, he renovates access roads and builds traffic circles in the style that he appears to have inherited from Ariel Sharon, with whom he worked for a long time in the 1980s. The percentages always work in the settlers’ favor. On Monday, for example, building inspectors arrived at a Shavei Shomron neighborhood along with directors of the Civil Administration, and demolished six illegal temporary structures. 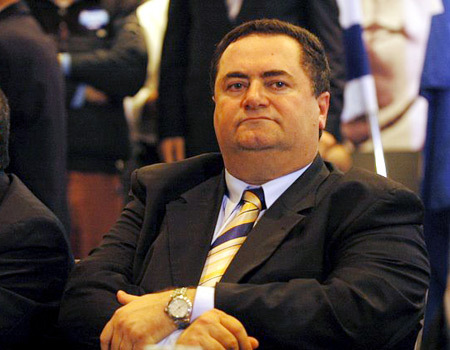 Samaria Regional Council Chairman Gershon Mesika was quick to accuse Defense Minister Ehud Barak, “who wants to show the people in his party that he is doing something.” Barak is the man the settlers hate most at this time, as the person still poking a stick in the wheels of the trucks bringing the trailers, and here and there, stopping construction. “For me, he is a minister in the Palestinian Authority,” one settler woman from Revava told Katz. “How many units,” Katz asked. The opening was supposed to be a bit more festive. After all, the negotiations with the Palestinians are being renewed after a year and a half of a breakdown of communication. True, these are only proximity talks, a kind of indirect negotiations, but we are finally returning to the table. Both sides, however, are behaving as if the talks were forced upon them, as if they are doing the Americans a favor, despite the fact that for both Netanyahu and Abu Mazen, the renewal of the talks is a political oxygen balloon. So the Palestinians do not know when they are coming, and Netanyahu wants to talk about water rather than borders — in brief, we are starting off limply, which bodes ill for the future. If the proximity talks are beginning in a cloudy atmosphere of uncertainty, their end — paradoxically enough — is much clearer. In four months, what lies in wait for us is an explosive charge that no one is thinking about how to start to disarm: Towards the end of September, the period of the construction freeze in the territories will end. But the government is burying its head in the sand and waiting for a miracle. Anyone who believes that fear of the government has suddenly befallen the Jewish settlers in the West Bank, and therefore they have been maintaining relative quiet until now in the face of the construction freeze — is somewhere between a dupe and a fool. It is not the firm hand of the police, or even the diligence of the Civil Administration inspectors. This quiet has only one reason: The council chairmen in Judea and Samaria and the residents are convinced that at the end of September, all the dams will be broken down and thousands of new buildings will rise on every hilltop. This is what they have been promised. It was neither hinted nor implied, this is what cabinet ministers said to them explicitly. No one is preparing them for the possibility that the situation could be different. The battle against the freeze started with very strident tones. Three months before the freeze, local construction committees already met for days on end, approving plans. And so, on the day the freeze began, when a UAV was sent to film the area, it discovered hundreds of foundations for new buildings. A battle was waged over these housing starts in the first weeks of the freeze, until the settlers realized that it was all eyewash. That they should calm down. The construction may be halted for a short time, but then everything will be permitted, and even more. They had something to cling to, because the freeze was not complete. The construction of 300 housing units in Beitar Illit, which was approved in 2008, was not stopped, and the construction of schools, synagogues and ritual baths continued. True, the construction in urban settlements was frozen, but the construction of private residential houses in the settlements continued. Moreover: No illegal settlement outpost was removed. It is true that building expansions were prevented in several places, but no illegal house that was built was demolished. The argument was that the outposts and the illegal construction were not being touched, because all the efforts were being put into enforcing the freeze. So all of the 87 illegal settlements that remained from the Talia Sasson report—are still there. The council chairmen in Judea and Samaria were recently given planning powers. They cannot approve construction, but they can plan. And during the freeze, plans were prepared on a huge scale, and these are awaiting, at the end of the pipeline, for the day the order will be given. And that day is known to all: The end of the freeze period, on September 25. And what if they are not given authorization to build? No one is preparing for the possibility that the proximity talks will develop into direct talks, which are contingent on the continuation of the construction freeze. No one is willing to face up to the settlers and say to them: Israel made a commitment to the US not to make any unilateral moves on the issue of construction in the territories, without coordinating with them in advance, so that neither side surprises the other. If the settlers want to blow up the coalition and break up the relations with the US, this will be their opportunity. The Israeli government, as usual, is neither willing nor able to cope with them.